At peak viewing time, it broadcasts gruesome images of their purported crimes before interviewing the convicts, who appear clad in orange or yellow jumpsuits. Baghdad, Iraq: Every Friday in Iraq, a gripping show on state television beams the alleged confessions of death-row jihadists into homes around the country. Baghdad declared victory against the ISIS group in December, after years of fighting to regain vast stretches of territory the jihadists seized in 2014. Iraq has detained thousands of suspected members of IS, a group infamous for deadly attacks, mass killings and the execution of detainees in orange jumpsuits. Once a week, a show titled "In the grip of the law" escorts convicted jihadists back to the scene of their crime under heavy security. By spotlighting ISIS atrocities, the show aims to stamp out any remaining support for the jihadist group's ideology, its presenter says. "I get tipped off by the interior ministry, the defence ministry or national security, who captured them," Ahmad Hassan, 36, says. 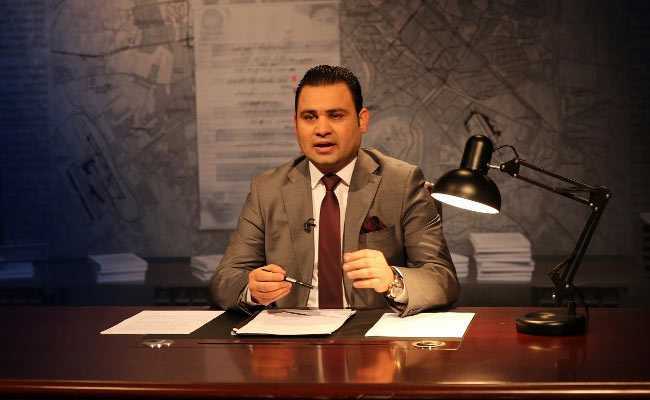 "They choose the case to highlight and I ask the justice ministry for permission to interview the convict," says Hassan, whose show is aired by state channel Al-Iraqiya. The programme is up to its 150th episode, he says, and not about to end any time soon. "Even if IS has lost militarily, its ideology still exists," he says. "Its supporters view others as non-believers and will continue to murder as long as its ideology lives on." Dressed in a beige suit and brown tie, on a set meant to evoke a detective agency, Hassan starts his show each week with shocking images. One episode opens with a photo of dozens of Sunni tribesmen lying in a pool of their own blood, after their 2014 execution by ISIS in the town of Heet, northwest of Baghdad. It then introduces Mithaq Hamid Hekmet, 41, one of those condemned over the massacre, who recounts the killings in chilling detail -- even citing the names of others who took part. On the show's set, a mahogony desk, stacks of papers, maps of Baghdad and mugshots of the day's convict seek to create an intriguing atmosphere to draw in viewers. In another episode, former IS finance official Mohammad Hamid Omar, nom de guerre Abu Hajjaj, describes his speciality: extorting funds from pharmacies, schools, real estate agencies, petrol stations and doctors. Hassan says all of his interviewees have been found guilty and sentenced -- most to death, but some to lengthy prison terms. They are mostly Iraqis, but also sometimes nationals from other Arab countries. Some have since been executed, Hassan says, but "that's the justice ministry's business, not mine". Iraq executed more than 100 people last year, mostly after "terrorism" convictions, the office of the UN High Commissioner for Human Rights has said. The country's anti-terrorism law orders the death penalty for any person who commits, plans, funds or assists in acts of "terrorism". Hassan says all his convict interviewees take part "voluntarily", and know participating will in no way help to alleviate their sentence. "They do it because they have regrets," he says. "They want to show the horrendous acts they have committed and reveal the thinking of the group they belonged to, to persuade others not to make the same mistake." The show's most poignant moments are meetings set up between the convicts and the mothers of their purported victims. In one such scene, the mother of two policemen killed by ISIS vents her anger. "Why did you kill my sons Ahmad and Hamid?" she asks three sentenced jihadists, who hang their heads in response. "They were your friends. Did they ever wrong you? Why did you destroy my family?" asks the woman, dressed from head-to-toe in black. Another woman, whose son ISIS shot in the head, asks four prisoners: "How can you eat with those hands that killed my son?" Human rights groups have criticised the programme for showing death-row inmates on television before their execution. Hassan says the interviews comply with human rights laws. "We don't pressure anyone," he says. "But we're in a situation of war and it's best to focus on the rights of victims, rather than those of the terrorists". Interior ministry spokesman Saad Maan is a fan of the programme. "Thanks to this show, people can see security forces provide true information. It creates bonds with the population."